We strive to give you unmatched quality of work and superior customer service while offering a full array of lawn care services designed to minimize the time you spend working on your lawn. Our weekly mowing service will keep your weekend hassle free and your lawn looking professionally manicured. We use only walk behind mowers. Weekly mowing consists of mowing, trimming, blow-off and removal of bagged clippings. In addition to mowing, we also offer spring and fall aeration to increase your lawn’s ability to absorb water and nutrients. To keep your lawn fed, green and healthy all season long, we recommend our six-month slow release fertilizer. 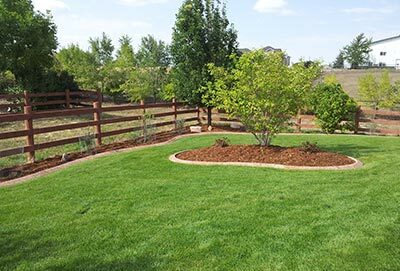 To maximize water utilization, we also recommend our three-month soil treatment to help prevent brown out dormancy during our hot Colorado summer months. Lastly, we offer a six to eight-month pre-emergent weed control program for both your lawn and non-lawn areas. The best way to eliminate weeds is to prevent their germination. Our spray program is effective against both broad leaf weeds and weedy grasses. We are licensed as commercial applicators with the Colorado Department of Agriculture.